Description on Atma, Mana, Nidra, Swapna, Indriya. 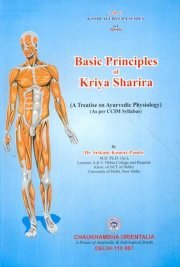 This book on "Basic Principles of Kriya-Sharira" basically a treatise on Ayurvedic physiology mainly designed as per CCIM Syllabus for U.G. & P.G. studies and is scholar friendly. The subject matters that are described in this book are briefed and well established. A new dimension of applied physiology of different doshas and their produced diseases and also the therapeutic measures applied for checking them has been enumerated. Thus, it will help the scholars, teachers and physician a scientific idea for further observation. Bibliographic Information: xvii, 230p., tables, Ref.